So I normally don't post recipes for 'real food' because cooking's J's thing. Not mine. I'm more the baker in the relationship BUT tonight, I stumbled across something delicious that I just have to share. My friends, I present: Wedge and Veg. I'll admit, the recipe's not really mine. When I lived in London, I saw one of my flatmates making this one night and it was so good, I bugged her for the recipe when I came back to the States. I made it once and it didn't turn out so well but I made it again and goodness. gracious. That is all. Cut up as many potatoes as you want any way you want. (See? Not a very good recipe writer). I cut up four Yukon golds in both cube and wedge shapes. Next, cut up whatever vegetables you want in it. I went for red pepper in wedge shape. Spread the root vegetables onto a baking sheet covered in foil. Let bake at 425 for about 25 minutes. I went ahead and put my pepper into a bowl where I mixed in the spices and the oil. 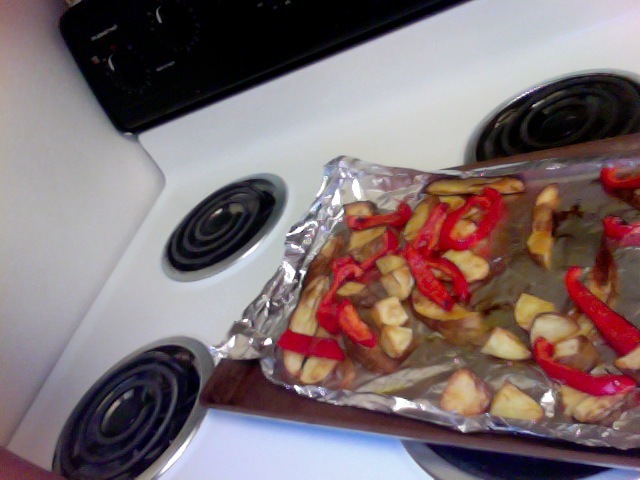 After the potatoes were in for 25 minutes, I put the pepper on top and let it bake for another 15 minutes. and it is so delicious, it is just ridiculous. I made it as a snack but I'll probably end up inhaling the whole thing in about an hour. I'm sorry the recipe is so... lacking but I had to get this out into the universe. You'll thank me for it later.